North Carolina Central University (NCCU) School of Law is committed to providing, modeling, supporting and integrating technology which is seamless, up-to-date, and is easy to use. The Law School Information Technology Services (ITS) Department provides direct assistance to students, faculty and staff by supporting and maintaining laptop computers of the faculty, staff and students. Additionally, Law School ITS personnel maintain the desktop computers, printers, servers, computer lab, and audio/visual equipment located throughout the Law School. NCCU School of Law faculty use The West Educational Network® (TWEN®) and LexisNexis Web Courses powered by BlackBoard™ for online classroom management. These systems were specifically designed for usage in law schools. All NCCU Law classrooms use Interactive Response Technology software to create an interactive system for in-class use. This Interactive Response Technology enables professors to monitor student comprehension in the classroom. Students use hand-held wireless remotes (known as “clickers”) to respond to professor-created questions using a powerful assessment software that enables them to create tests; and manage, track and evaluate the results. Once students respond to questions using their remotes, the assessment software automatically summarizes results in a pie chart or bar graph. The instant response enables professors to instantly adjust their lesson plan in response to the level of overall comprehension. Professors record class and guest lectures for student viewing outside of the classroom. Streams of video, audio, slides, desktop images and more can be recorded simultaneously by any equipment and are captured. All data is uploaded into one presentation. Students receive a link to view the lecture. Students benefit from lecture capture in numerous ways. Students can watch lectures from anywhere with an internet connection. They can study more efficiently by reviewing specific portions of lectures. Professors use lecture capture viewing statistics to know what students are watching. 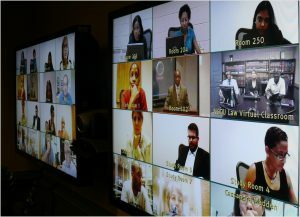 Professors can schedule recordings in advance, even from remote locations, and provide a live broadcast to their class.